Remember that hazardous driving situations can happen at any time. Always be aware of what is in front of you, behind you and beside you, so that you are ready for unexpected hazardous situations and have the time to take necessary actions. Use your rear-view mirror and your side mirrors at frequent intervals, especially before signalling, braking and turning, to check what other road users are doing. Drivers can only use front and rear fog lights in hazardous weather conditions. They must not be used at other times. Always ensure that you and your passengers are wearing properly fastened and adjusted seatbelts. Most modern vehicles are fitted with laminated glass, so a windscreen will only 'crack' under impact however, if the glass shatters and you can't see, slow down and use another way to see ahead, such as opening the side window and looking out, gently put your foot on the brake to warn following traffic that you are about to stop. Come to a stop slowly and carefully. Stop off the road or as close to the left side of the road as you can with safety. Driving on gravel roads or other roads with loose or shifting surfaces requires much care and attention. Driving on these roads is more hazardous than driving on bitumen roads. As control of the vehicle and braking are more difficult, drivers should slow down to maintain safe control. When driving on a gravel road, which has half of the tyre grip or friction of a bitumen road, a driver will need double the distance when braking to a stop as compared to the braking distance normally required on bitumen. Similarly, when driving around a bend on a gravel or unsealed road, loss of control of the vehicle (skidding) will occur at a much lower speed, compared to the control you would have when driving around a similar bend on a bitumen road. Before attempting to overtake on a country road, ask yourself whether it is really necessary as you may not be saving much in travel time. Always check your mirrors and over your right shoulder for vehicles behind you, before signalling and then overtaking, but hold back if you cannot clearly see if there is enough space ahead. 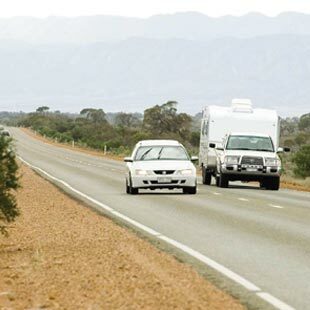 Marked overtaking lanes on country highways provide safe ways to overtake. When using these lanes, you must always drive in the left lane unless you are overtaking. When overtaking, turn your headlights on so other drivers can see your vehicle. In fact, if your vehicle is not fitted with daytime running lights (which turn on automatically) turning your headlights on when driving on country roads can increase your safety. Sometimes on country roads, you may encounter slow-moving vehicles such as tractors and other agricultural machinery or bicycles. Take extra care when approaching them as you will have less time to decide whether to safely overtake them than with other faster moving vehicles. Safe drivers travel at a speed that enables them to slow or stop their vehicle to avoid a collision in situations where sight distance is limited such as around curves and over crests. Bicycle riders are extremely vulnerable road users on high speed roads and wind created by your vehicle when overtaking can have a significant effect on the stability of a bicycle. When overtaking a bicycle rider, allow at least 1 metre clearance, 1.5 metres if travelling over 60 km/h. If possible, on multi-laned roads, move entirely into adjacent travel lanes to overtake. You also often meet heavy vehicles on country roads and highways. While long-distance vehicles typically use the main interstate routes, livestock transporters, milk tankers and grain trucks will often be encountered on other roads. Many heavy vehicles travel at night, which makes it is more difficult to judge their speed and how close they are. If you intend to overtake a long vehicle, stay well back from the rear of the vehicle while waiting for a safe, clear overtaking opportunity. This will allow you to see further along the road past the heavy vehicle without having to move too far to the right. It will also reduce the risk of having your windscreen broken from any stones flicked up by the tyres of the truck. Watch out for trailers or caravans that may sway from side to side. By holding back, you will also allow vehicles approaching from the opposite direction to see you earlier. After heavy rain or a burst water pipe, if a large puddle of water appears across part of the road and you need to drive through the water, slow down before driving through the water to avoid losing control of your vehicle. 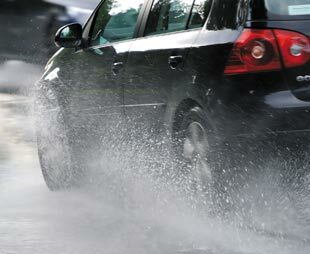 If you drive too quickly through a puddle you risk the car aquaplaning or sliding and becoming uncontrollable. If water over the road could be too deep for your vehicle, stop and check the depth before driving any further. After driving through water, always check your brakes to be sure they are working effectively. If water has reached the brake linings, the brakes will not be as effective. An easy way to dry them out is to drive for a short distance with your foot pressed gently on the brake. When driving in country areas, it is not uncommon to encounter livestock (e.g. cows or sheep), which may have wandered onto the road, or may be being moved across or down a road. Animals such as cattle, kangaroos, emus and even dogs and cats can be hypnotised by the glare of headlights. If an animal is on the road in front of you, brake slowly, sound your horn and flash your headlights - don't swerve. Try to pass smoothly behind the animal. Kangaroos and many other native animals are especially active at night and at dawn. If a front tyre blows out, the vehicle will pull towards the side with the blown tyre. If it is the rear tyre, the rear of the vehicle will also tend to sway from side to side. Do NOT brake suddenly. Try not to over-react with the steering. Ease off the accelerator, keep a firm grip on the steering wheel and brake GENTLY to stop, keeping the car's steering straight ahead.